Up for review today is the Camacho Coyolar, a re-release of the original Coyolar which was discontinued in 2013 when Davidoff revamped the Camacho brand. I can’t say that I ever smoked the original Coyolar, and I’m generally a fan of the products Camacho puts out, so I’m excited to review this cigar. The cigar comes presented in a strong, if blunt, black band. 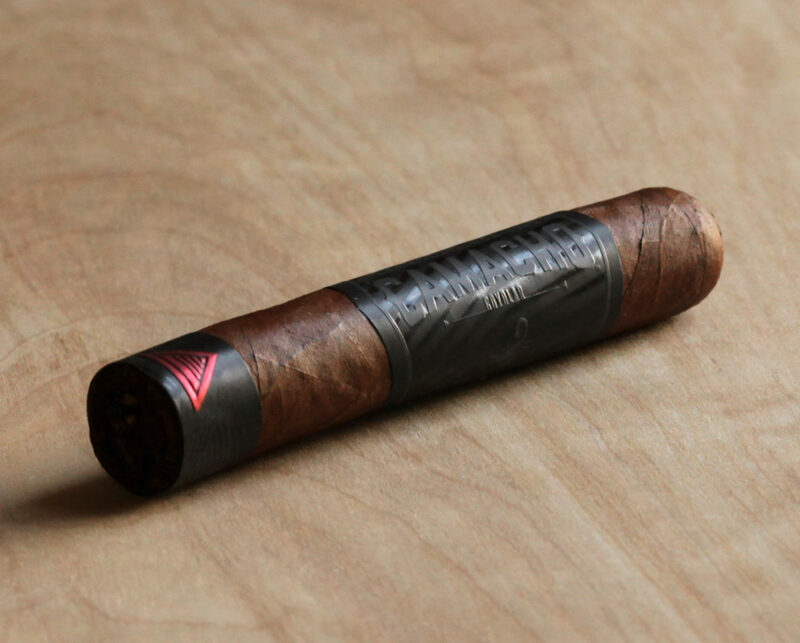 Camacho has run this visual branding play a few times now, with the Camacho Triple Maduro, Camacho Blackout, and Camacho Powerband all using black primary bands. Is it an attractive band? Sure, but it was damn near impossible to photograph and even to the human eye the name is only apparent when the light hits it just right. Not what I’d consider a good tactical play on the brand side. In any case, the outer Honduran wrapper is mostly smooth with a few visible veins. When squeezed, the cigar has a moderate amount of give and is packed mostly consistently, though there are some minor soft spots about two thirds down the cigar. The draw is perfect, and the cold draw is surprisingly flavorful, with a blast of fruit (something akin to mango/peach, which I’ve never encountered in a cigar before), and some mild spiciness. The foot is a bit more standard, with some minor chocolate and dried wood notes. The Camacho Coyolar opens with thick, medium to full bodied smoke. Lots of flavor and great smoke production. The profile is dominated by spice, black and red pepper, heavy leather, and some semisweet chocolate. The pepper is felt mainly on the tip of the tongue, the back of the throat, and on the retrohale. It’s very enjoyable, but I can already tell it’ll be overpowering at times as well. The retrohale is full leather and pepper, which reminds me a bit of the Camacho Triple Maduro. Half an inch in, the body is above medium but the flavor is up to full. And I’m conflicted. Though I’m enjoying the flavors, I’m also aware that my palate is on track to get exhausted well before the cigar ends. For this reason, this would be a cigar I’d recommend pairing with a sherry cask finished single malt like Glenmorangie Signet, Glenlivet 18, or the Glenrothes Vintage 2004. As the cigar heads into the second third, the flavors morph a bit along with the texture. The pepperiness settles down a bit and is replaced by peanuts. On the palate, pepper and spice are dominant, along with leather and a twinge of orange rind. The flavors aren’t often in perfect balance, but when they are, they work together well. Construction wise, the ash is mostly solid but with a bit of flakiness. The burn is a bit wavy. Burning into the final third, leather and spice are dominant. Otherwise, little changes and the cigar is ready to be retired right on time. Camacho continues to produce high quality, enjoyable cigars. The Camacho Coyolar has all the hallmarks of a full bodied Camacho smoke. Extremely rich, quite strong, with good complexity and enjoyable flavor. On the negative side, the smoke is often out of balance, which costs it a few points. As much as I’m a fan of full bodied flavors, the Coyolar gets a bit out of hand at times producing a smoking experience that’s at best overwhelming and at worst downright uncomfortable. Needless to say, I was glad I was smoking a rothschild size and not a toro.